Dried beans and black-eyed peas are excellent sources of protein. You can consume them as a healthy substitute for meat, according to MayoClinic.com. Dry beans and peas are low in fat, contain no cholesterol and packed with nutrients such as folate, iron, magnesium and potassium. 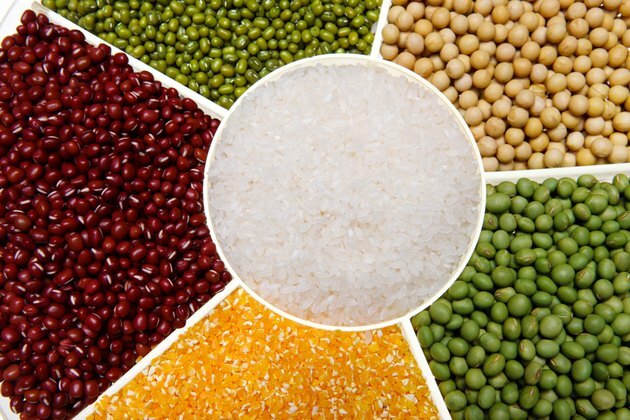 Legumes contain soluble and insoluble fiber. Proper soaking and cooking techniques dissolve the starches that cause intestinal discomfort, allowing you to enjoy all the nutrition and flavor black-eyed peas and beans have to offer. Soak dry beans before cooking unless you plan to cook the meal slowly enough for the beans to hydrate naturally. You may cook with dry black-eyed peas and beans by dropping them directly into slow cooked soup or stew when assembling the other raw ingredients. This technique works well in a crock pot or Dutch oven where the meal cooks for eight or more hours. You will otherwise need to soak the beans and black-eyed peas before cooking. Pour dry black-eyed peas and beans into a large bowl. Remove any stones or debris. Measure the appropriate amount of beans into a large stock pan. A pound of dry beans will result in about 6 cups of cooked beans. Soak dry beans in water before cooking. Add 10 cups of water for every pound of dry beans in a large stock pot and soak for eight to 10 hours. You may use the quick-soak method, which involves adding 1 lb. of dry beans to 10 cups of boiling water, returning the water to a boil for two to three more minutes and then soaking for one hour at room temperature. To decrease gas caused by consuming beans, use the quick-soak method of boiling the beans and soak overnight. Drain beans and rinse. Discard the soaking water. Cooking in the soaking water results in uncomfortable gas and makes your food taste unpleasant. Wash and dry the stockpot and return the beans to it. Cover the beans with three times their volume of water. For example, cover 5 cups of beans with 15 cups of water. Add spices and herbs as desired. Parsley, rosemary, thyme, sage and savory enhance most beans. Garlic and onion compliment the flavor of black-eyed peas and dry beans. Add baking soda if you have hard water. You may skip this step if you have soft water. Bring to a boil and then reduce the heat to a simmer. Prolonged boiling may cause the beans to fall apart and their skins to separate. Cook in a saucepan until tender. Small legumes cook more quickly so start checking beans and black-eyed peas after about 45 minutes of cooking. Add acidic ingredients, like salt, tomato and vinegar near the end of cooking time. These ingredients slow the cooking process. Beans and black-eyed peas are done cooking when you can easily mash them between two fingers or with a fork. Drain beans. Add to soups, casseroles, baked dishes and Mexican food. Cook black-eyed peas with ham or chicken.